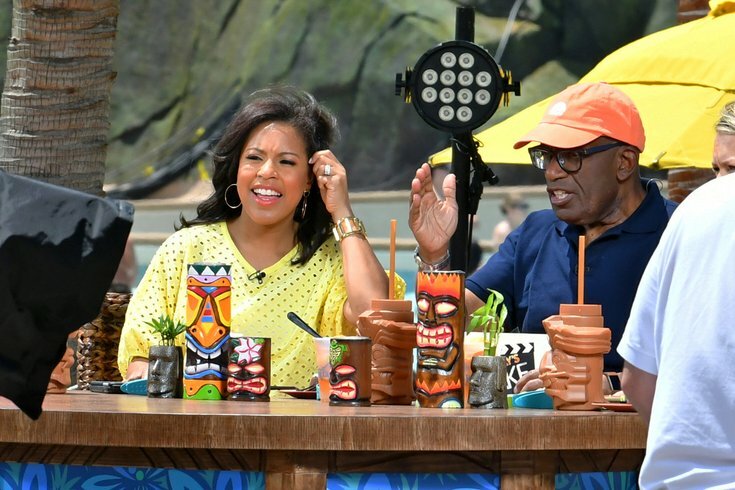 NBC's Today Show, including Al Roker (right) and Sheinelle Jones (left) broadcast during the grand opening of Universal's Volcano Bay water theme park at Universal Orlando Resort in Orlando, Fla. on May 25, 2017. Philadelphians are invited to show up for a live taping of the “Today” show as co-hosts Al Roker and Sheinelle Jones broadcast from the Comcast Center plaza Thursday morning in anticipation of the Eagles' first game of the season. The special event, dubbed the “countdown to kickoff,” will begin at 7 a.m., and later in the morning CNBC’s “Squawk on the Street” will air live, followed by “Mad Money w/ Jim Cramer,” who will take questions from the people on the street. NBC10 and NBC Sports Philadelphia hosts will join the national crew, who will be broadcasting all day long on location offering exclusive coverage leading up to the regular season opener. According to a news release, with the Birds returning to the field for the first time since their historic Super Bowl championship, this broadcast in Center City is warranted for a number of reasons. Not only will these TV show hosts be right downtown all day, they will be accompanied by the Vince Lombardi trophy, the “Sunday Night Football” bus, Swoop, the Eagles mascot, Eagles cheerleaders and countless giveaways, as well as other special guests. Roker and Jones will begin their live coverage at 7 a.m. The events on the Comcast Center plaza are open to the public and all are invited to show up, proudly display their support for the Eagles and share their excitement for the home team with a national audience. This broadcast will happen rain or shine. The Philadelphia Eagles host the Atlanta Falcons Thursday, Sept. 6 at 7:30 p.m. at Lincoln Financial Field.